Zipcar has been changing the way people think about driving since the year 2000. Things really took off with an app that launched in 2009 and it’s now one of the most successful car club companies in the world. With a mission to take more personal cars off the road and reduce congestion everywhere, it’s bringing use of a car to the people of the planet in a sustainable way. Zipcar claims that every one of its cars takes 10 personal vehicles off the road: it’s good for the environment and good for congestion too. Sister company Zipvan brings this sustainable, ultra-convenient ethos to the world of van hiring, with a fantastic fleet of vehicles ready to help you move your stuff. Industry favourites including the much loved Volkswagen Transporter dominate its range, so you can be sure of the highest quality when you book. With 5.8 cubic meters of loading space and a maximum weight capacity of 1 ton, it’s got plenty of room to fit everything you could possibly need. With Zipvan, vehicles like this are more accessible than ever, meaning all you have to do is tap at the app to get moving. How do I use my Zipvan promo code? You’ll get great benefits with your membership, so sign up today! Where is my nearest Zipvan? 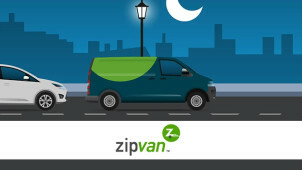 Is there a higher charge for younger drivers at Zipvan? For members under 25, there’s an extra charge of £1.50 per hour or £18 per day. This expires after 15 damage-free trips. How does insurance work with Zipvan? Coverage is included with your membership. You can purchase a damage fee waiver that would mean you wouldn’t have to pay a damage fee in case of an accident. A loss and liability policy covers injury and property damage to another party and the Zipvan driver, though not to any other members in the Zipvan. See here for more information. Got some errands to do and need a vehicle that’s up to the job? Check out Zipvan, a new van app that takes all the hassle out of sorting your to-do list. Don’t spend ages registering with a rental company, join Zipvan and you could be buckling up within minutes, and if you use a Zipvan promo code from vouchercloud your membership could cost a lot less. Then you just pay for what you need — hourly or daily! One of the great things about Zipvan is the simple pricing structure. After you’ve paid your annual fee you just pay for the time you use the van, by the hour or by the day. You don’t pay any extra for insurance, congestion charge or fuel costs (up to 60 miles per day). This means you can easily work out what you’ll be paying: there are no hidden extras you’ll have to fork out for. Get an annual Zipvan membership and it’ll be easier than ever to transport your bulky equipment, pick up furniture or carry out the dreaded big move. Use a Zipvan discount code from vouchercloud and your van rental fees could be cut even further. Its vans are currently in London, Oxford, Bristol and Cambridge and with more locations being added, now is a great time to join. You can even add other drivers to your account once you're a member!